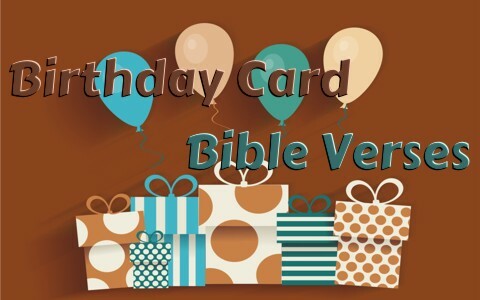 Here are 8 Bible verses that I believe would be great to use on a Birthday card or a note. Which ones might you suggest? These verses are simply astounding. I have heard some people say that they were “accidents” but God has no accidents. You were formed by God Himself, intentionally and with great purpose. The Hebrew word for “formed” is “cakak” and means “fence about, shut in.” The language is that of a weaver of fabric as being woven or stitched together with great intricacy and finite detail and in the “depths of the earth” mean in the secret or lowest parts of the human anatomy where no eye can see. Your frame was not hidden from God as it was from human eyes as God was “intricately” weaving your life together in a fearfully (or amazingly) way. Even more incredibly God says through the psalmist “Your eyes saw my unformed substance; in your book were written, every one of them, the days that were formed for me, when as yet there was none of them” (Psalm 139:16). The “unformed substance” is Hebrew (“golem”) for “embryo or fetus” and even before birth, every one of your days was written or recorded in God’s book. The psalmist says here that we were cast, literally, on God from birth and even in our mother’s womb, He was our God. Ephesians chapter one shows us the same things as Paul writes “he chose us in him before the creation of the world to be holy and blameless in his sight” (Eph 1:4). This declares the naming and giving of personality to us even before birth and shows that God sees things that are not yet as though they already exist. This is the context of Paul’s writing in Romans 4:17 when he was writing about Abraham “I have made you the father of many nations”—in the presence of the God in whom he believed, who gives life to the dead and calls into existence the things that do not exist.” God can do this because He is God and has effectual power to bring about what He purposes and nothing or no one can prevail against what He intends to do, even if it does not yet exist. You were a gift from God as that is what God calls children (Psalm 127:3) and what a great and precious gift they are. If you are now a parent then you should consider your children as gifts from God as He declares through Isaiah (66:9) “Shall I bring to the point of birth and not cause to bring forth?” says the LORD; “shall I, who cause to bring forth, shut the womb?” says your God.” God opens the womb and He can close the womb, whichever His will is. The fact that you are even reading this reveals that it was God’s will that you be born and that He willed for your mother’s womb to be opened up so that you could be born and be alive today. For you and for me, truly “This is the day that the Lord has made” and so we should “rejoice and be glad in it” (Psalm 118:24). Let me say upfront that I know this verse is not about a human birth but the same thing still applies. God commanded that you were created and the day of your birth was established in the heavens before the earth even existed (Eph 1) and so we owe God our praise and our thanksgiving. Yes, this Bible verse is about the creation like the stars, the sun, and the moon, but were we not also part of His creation? Indeed, we were! This Bible verse shows that we are God’s workmanship and He created us for good works and these good works were prepared long ago, before we were even created. That is too hard for my mind to wrap around but these things were appointed for us to walk in them (do them) before the earth existed, meaning before we were even created. Imagine this fact; you were God’s workmanship and God never makes a mistake. Yes, I understand that this was written specifically to Jeremiah the prophet but God also did the same for us; He knew us before we were formed in the womb. He has called us for a great purpose. He has appointed us to do good works before we even existed (Eph 2:10) and He was the One Who formed you in the womb (Psalm 139:13-15). Imagine that God had even called you by name before you were even conceived. I hope these Bible verses show just how precious life is. God is the giver of life and also the imparter of eternal life and that second birth I wrote about earlier assures that those who repent and trust in Christ shall never die again or as Jesus says “I am the resurrection and the life. Whoever believes in me, though he die, yet shall he live” (John 11:25). Previous post: Why Are Jesus and Satan Referred To As The Morning Star In The Bible?